For about a year now, Marvel has been exploring the intersection between rap and comics via a series of hip-hop variant covers, transplanting characters like Ant-Man and Black Widow into the world of influential rap artists like Missy Elliott or The Notorious B.I.G. The series has garnered strong positive reactions from critics and consumers, including a hardcover collection earlier this year, featuring an introduction from pop culture critic (and Black Panther comics author) Ta-Nehisi Coates. Today, the comic giant announced another slate of covers, tributing recent work from Kanye West and Vic Mensa, and an old classic from Jay Z (who was also sampled for a Black Panther cover earlier this year). First up: an Elektra cover from Keron Grant, with the notorious ninja standing in for the rap mogul on American Gangster, while artist Tim Bradstreet helps heartless killer Bullseye mimic Mensa’s recently released There’s Alot Going On. 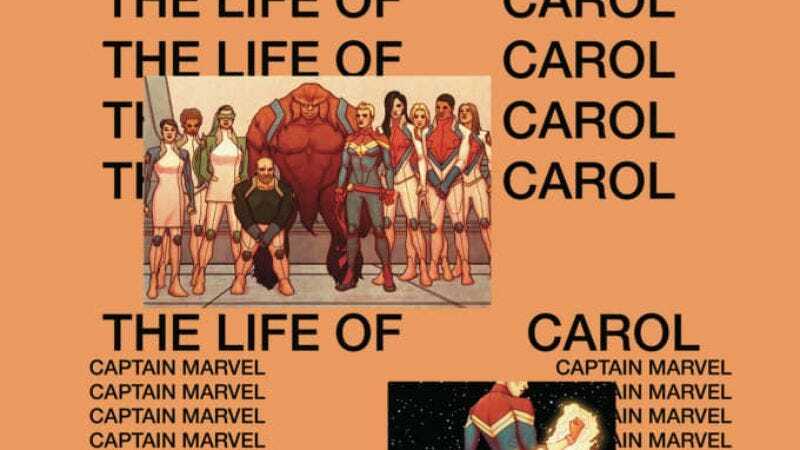 The most eye-catching entry, though, is the one for Mighty Captain Marvel #1, which sees its star character living The Life Of Carol, courtesy of artist Jenny Frison, utilizing the iconic orange tones and disconnected text of West’s recent The Life Of Pablo.